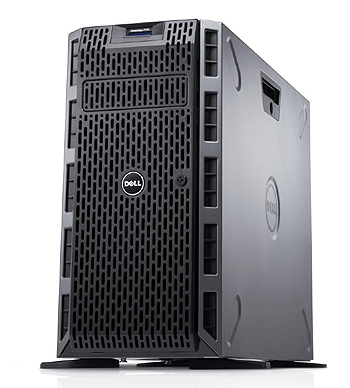 Dell's PowerEdge T620 is a feature-rich, two-socket tower server powered by the Intel Xeon E5-2600 or E5-2600 v2 processor product families. The PowerEdge T620 can hold up to 768GB of memory and storage capacity of up to 48TB is possible. With up to 24 processor cores and high memory density, the T620 shines in its ability to handle demanding virtualization environments and is an excellent choice for key workloads such as databases, web serving, customer relationship management (CRM), medical imaging and security management. A flexible server with excellent energy efficiency and acoustical performance, the PowerEdge T620 is a good fit for quiet office settings, remote branches and open office environments. 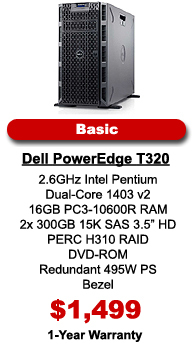 The PowerEdge T620 can hold up to twelve (12) hard drives in the 3.5" chassis or thirty-two (32) if the 2.5" form factor is chosen. While a tower chassis is the primary form factor, the PowerEdge T620 can also be rack-mounted for growing IT environments. Like previous server generations, the PowerEdge T620 features a multitude of configuration options including Intel dual-port 1GbE LOM, redundant or non-redundant power supply options and seven (7) PCI Express slots. 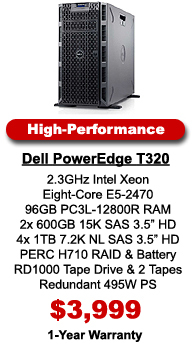 The PowerEdge T620 offers premium enterprise-level performance in a small, convenient package. Considering Virtualization? Check the VMware Compatibility Guide to be sure the release you intend to use will work with this server model and configuration. Choose a pre-configured system below or Flagship Technologies can build a custom server configuration based on the needs of your current IT project or datacenter. 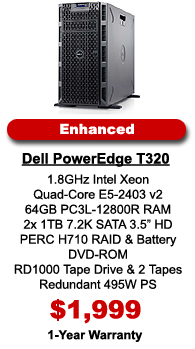 If you're looking for replacement/spare parts for the Dell PowerEdge T620, please select a category below.